Today and tomorrow are going to be filled with reunions and gatherings throughout the US as the Thanksgiving holiday is upon us. For many of us it is a chance to connect with family and friends, and connect back to old places where we have memories both good and bad. Holidays themselves all a call to remember what has happened and to commemorate and/or celebrate something, some one, or some event. For this reason, we see people either looking forward to or dreading this time of year because we cannot escape the signs of the season, and they seem to begin their invasion of our offices, cafes, stores, and neighborhoods earlier each year. This is also a time of year that we are confronted by the fact that our lives are not static as people are continuously coming into our lives, and leaving our lives. While we may not have to deal with the ebb and flow of people on an everyday basis, it unavoidably confronts us during these gatherings. In some ways this is exciting, like if a new member of the family has been added, such as the birth of a child, (this is my sweet Sophia’s first thanksgiving) or a new marriage. However, some people dread these times, maybe there has been a death, or a divorce, but there is clearly an absence that cannot be ignored. During this time, we need to remember that no matter the people that come into our lives or leave our lives, God is constant. Take time out of your day today or tomorrow and look at the things that surround us and allow them to be our altars where we remember that God has been with us. 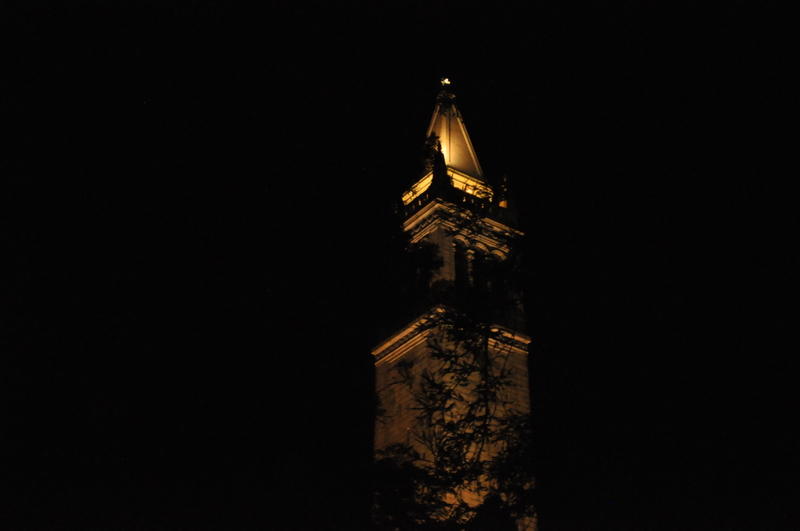 The picture above is of the Campanile on the UC Berkeley campus, which reminds me that God is always beside me, even when it gets very dark and I have trouble finding hope. The people of Israel, as they crossed the Jordan, grabbed stones from the dry river bed and placed them on the banks of the Jordan to remind themselves and future generations that God had been there to allow them to enter into the promised land. The history of Israel had many ups and downs, but God never left them, and no matter what, the stones were there to remind them that it was God who led them into the promised land. I have so many friends that each time we connect I am reminded that God loves me, and that it has been by His grace and mercy that our relationships have grown and flourished even though time, distance, and life have created space between us. So for those of you who I have not seen in a while, I thank God because of you, I thank God that our lives have crossed paths, and I thank God that because of our relationship I have become better than I was before we met. So to my old familiar friends and places, I am thankful for you!